You may be aware of Blaxland Riverside Park? The huge play space with flying foxes, a tree house, water play and even a giant swing. 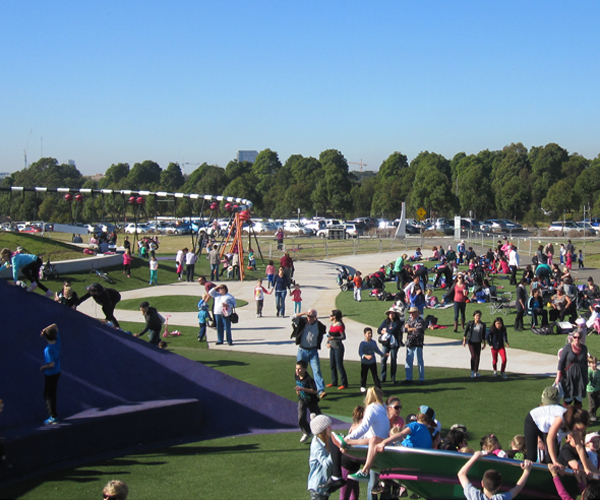 This colourful location, affectionately labelled by children as Tele Tubby land, is one of our most popular parks. A sunny weekend day attracts big crowds of children and families to enjoy a picnic, a play, and possibly a stroll by Parramatta River. Crowds are great, we love crowds here, and we love to see our parks used by so many happy faces. The problem is…our grass struggles to cope with all the feet running over it, not to mention the bikes and scooters rolling over it. The grass gets so compacted, that unfortunately it dies. So what do we do? Plant more grass so the same problem arises in the future? It’s not the most sustainable outcome, and sustainability is at the core of how we choose to run Sydney Olympic Park. So…..we have upgraded some dead turf and installed more resilient synthetic grass near the swings at Blaxland Riverside Park. Not only does the synthetic grass look better year round, we will also be able to save water, reduce time in ongoing maintenance, be usable in all weather conditions without getting muddy and the synthetic grass will be able to cope much better with all of our friends who come to play. ‹ Want to know more about a Park’s Life?